Two Portuguese designers, tired of watching clothes hangers tossed aside after a brief life on the rack, decided to reclaim them as functional art. Diogo Agular and Teresa Otta of LIKEarchitects rescued 2,000 colorful IKEA children’s hangers that were destined for the landfill and designed a technicolor Chromatic Screen for the 2012 Oporto Show, the most prestigious event for interior design and architecture on the Iberian Peninsula. Hangers are probably one of the more boring of life’s necessities. They’re literally a dime a dozen, and except for some extra padding now and then, coat hanger design has remained pretty static since the early 1900’s. Still, their simple but functional shape allows us to organize clothes neatly on a hanging rack, and most of us couldn’t imagine our closets without them. Dry cleaners, laundromats, and clothing retailers consume millions of wire hangers a year, wasting thousands of pounds of steel on what many see as a single use product. Plastic hangers are even worse, requiring massive amounts of petroleum to make a product that’s nearly impossible to recycle. As those who practice the three R’s (reduce, reuse, recycle) know, recycling should only be a last resort. A little creativity can turn something as boring as the hanger into a work of art. At first glance, Agular and Otta’s Chromatic Screen appears to have a simple, semi-circular design. Upon closer inspection, however, viewers are dazzled by the unique interlocking nature of the hangers’ shape. The bright colors interact for a dynamic viewing experiencing, appearing to shift and vibrate depending on one’s position and movement. The designers say that, just like their frozen trees made from IKEA plastic bag dispensers, the temporary sculpture was created to toe the line between architecture, design, urban installation and art, and inspire a more imaginative reuse of everyday objects. I am certainly inspired to find more imaginative ways to repurpose objects- congratulations, designers, you have achieved your goal! Undeniably awesome installation... Undeniably done before: http://www.jacobdahlgren.com/images/cloth_hangers.htm Design imitates art? 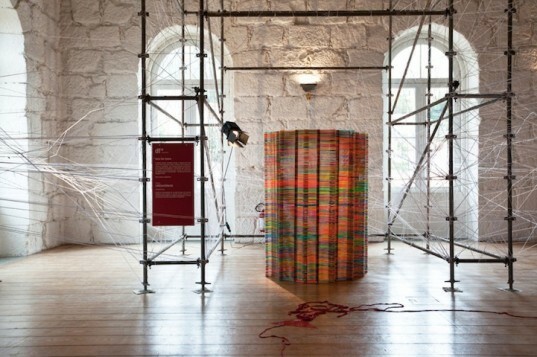 Two Portuguese designers, tired of watching clothes hangers tossed aside after a brief life on the rack, decided to reclaim them as functional art. 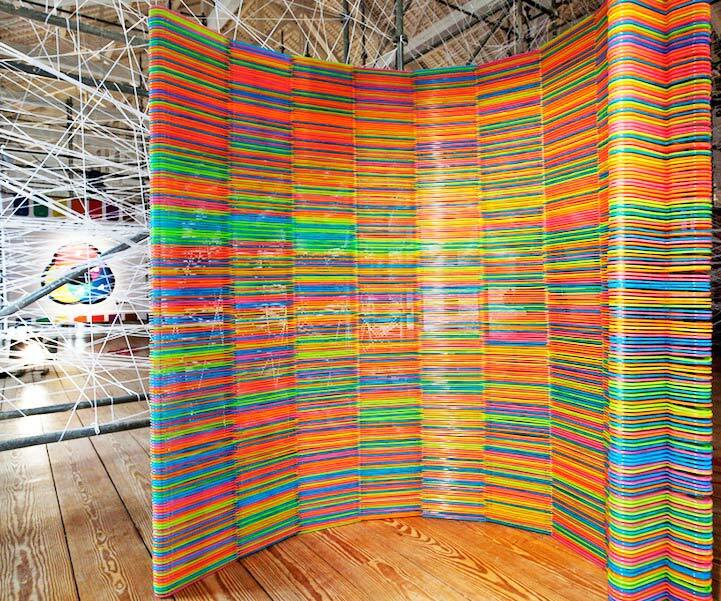 Diogo Agular and Teresa Otta of LIKEarchitects rescued 2,000 colorful IKEA children's hangers that were destined for the landfill and designed a technicolor Chromatic Screen for the 2012 Oporto Show, the most prestigious event for interior design and architecture on the Iberian Peninsula.